The dwarf coral tree is an ideal tree or shrub for the small garden, especially for people who love the scarlet flowers of the common coral tree (Erythrina lysistemon) but don't have the space for a large tree. Its small dimensions make it ideally suited to high density housing complexes where garden space is limited. Erythrina humeana produces an impressive display of scarlet red flowers en masse, which are a favourite with many different birds who enjoy the nectar. Almost as though it was designed for the garden, the dwarf coral tree produces its flowers just at window height which allows you to do your bird watching from the comfort of your favourite sofa. 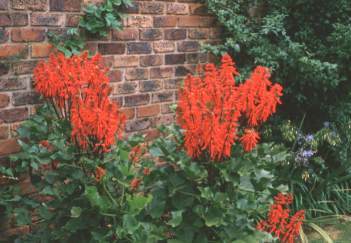 Similar to the ploughbreaker (Erythrina zeyheri) and the tamboekie doring (Erythrina acanthocarpa), the dwarf coral tree can tolerate cold and frost by going into winter dormancy and simply re-sprouting from the large swollen tuberous roots as soon as spring arrives. The dwarf coral tree produces a number of stems from the ground up to approx. 1.2 - 1.5 m high at which point they branches and produce a mass of scarlet red clusters of flowers on long black stalks making them ideal for the vase. The flowers are rich in nectar and attract a variety of birds but are the favourite of the brightly coloured sunbirds. Plants are easy to propagate from seed or cuttings, and this species can also be propagated by the use of truncheon cuttings (very large cuttings). Truncheons are made from part of or even an entire branch which is planted into a pot filled with sharp sand or even directly into the soil where the plant is to be grown. This should be done in spring (September to November in South Africa) for best results. 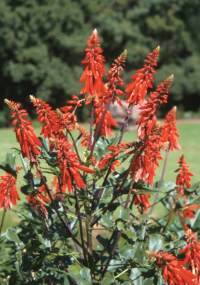 The dwarf coral tree is easy to grow and is very drought hardy. It thrives under normal garden conditions providing it gets full sun and doesn't have wet feet. Should your garden be in a position where it receives a fair degree of frost don't despair as the dwarf coral tree can tolerate quite a bit of frost especially once it has become well established in your garden. If you do not have frost however, it will not die down but rather produce the new season's growth from the previous season's stems. In such situations it may be necessary to prune it hard once every three or four years. The dwarf coral tree is deciduous (loses all its leaves and goes dormant during the winter months). Although it would be ideal to keep it dry during the winter months it will tolerate light watering of winter annuals around its feet and as it is leafless it allows full sun to reach the annuals that you may choose to fill its gap during the winter months. The attractive signal red "lucky bean" seeds are produced in curious knobbly black pods. The seed should be collected as they are often in short supply. So collect all your seeds and share them with your friends and local nurseries so that others may also share in the breathtaking display that the dwarf coral tree will make in your garden. There are 2 important things about this plant/ tree which should be mentioned in the first paragraph, (not at the end), I think. Especially for people living in winter rain areas, ie. it is not suitable!